Of all the plans for Newark's future, perhaps the most exciting, controversial and long range is the call for the construction of a massive sports center in downtown Newark slated to be completed by 2003. If built, it would occupy an area in the central core of downtown near Penn Station. Alternate plans have been developed for an arena. The most expansive calls for an 18,500-seat stadium, a 30,000 seat soccer stadium, a television studio, hotels, more than two dozen restaurants, parking decks and a 1.5 million-square-foot office cluster on a 40-acre site that is now home to parking lots, scattered private housing and storage facilities. Interest in hotel construction has come from the Marriott, Starwood, Resorts, Sheraton and Westin chains. As major owners of the New Jersey Nets, entrepreneurs Raymond Chambers and Lewis Katz want to bring the team to town from the Meadowlands. They have the support of former Gov. Thomas Kean, who heads a committee which seeks to ensure that Newark will in fact become a major sports center for the tri-state area. The waterfront park project is dedicated to the restoration of one of Newark's most valuable assets, the Passaic Riverfront, which extends from the Bridge Street Bridge, past the New Jersey Performing Arts Center, the Legal Center, the massive Gateway towers, Pennsylvania Station, Blue Cross and Blue Shield of New Jersey, New Jersey Transit and then past Market Street, past Riverbank Park and ending at Brill Street. This ambitious multimillion dollar endeavor is part of a larger $1.8 billion Army Corps program to restore the river and control flooding throughout the upper Passaic Basin. If successful, the project could serve as a linchpin of a downtown revival—a landscaped corridor that will turn one former industrial strip into a major recreational riverbank parkland. The partners playing an important role in the project's completion include the U.S. Army Corps of Engineers, the state Department of Environmental Protection, Newark and a variety of community groups. Improvements call for replacing the existing bulkhead, rehabilitating stream banks, creating parks and recreational areas and a tidal wetlands, laying walkways and benches, and lighting the entire length of the park. Support has come from the Governor's office and Rep. Rodney P. Frelinghuysen, a member of the House Appropriations Committee; Frelinghusen's ancestors, including a mayor, helped build Newark. Ground for the first phase of Minish Park, named for a former Newark congressman, was broken on November 23, 1999. When the light rail transit, or LRT Newark, comes to town, it will connect the city to a wider world of commerce and economic activity. Just as Newark enormously profited from the trolleys of the late 19th and early 20th centuries, the proposed 8.8-mile Newark/Elizabeth trolley link is expected to spur a modern-day boom. Scheduled to be built in three phases, the system eventually will connect Bloomfield/Belleville via the present Newark City Subway to the downtown and on south to the airport and Elizabeth. Eleven grade crossings are planned. In 1996, the cost of the first stations designed was set at almost $600 million. Final design and property acquisition and vehicle purchase are expected to cost over $191.5 million. The joint venture is being undertaken by BRW Inc. and Parsons, Brinckerhoff, Quade and Douglas. To accommodate the trolley system, McCarter Highway (Route 21) at the New Jersey Performing Arts Center will be relocated approximately 100 feet to the east, where it will be widened and improved. A new terminal and maintenance facility will go up in Bloomfield, east of the lot which was once Bamberger's warehouse. One hundred new cars have been ordered for the Bergen/Hudson County gold coast line and for the Newark/Elizabeth line at a cost of $3 million per vehicle. The new coaches will replace the half-century old present subway cars, sitting just 14 inches instead of 39 inches above the rail surface. They will make it considerably easier for wheelchairs, strollers or shopping carts to enter. Selection of the lower car was quite controversial, but the argument that 2,000 are now in use in Europe helped turn the tide in their favor. As part of the first phase of construction of the Newark/Elizabeth link, the new subway cars will cost approximately $120 million, the Bloomfield/Belleville maintenance shop $69 million and the upgrade of the electrical system $4 to $5 million. By the middle of this year, both tunnel construction and grade crossings are supposed to be under way. It is estimated that the daily ridership of 13,200 will eventually increase to 24,000. The 1990s saw the arrival of the monorail. In May 1996, the airport monorail opened, moving great numbers of passengers to the three terminals in an efficient and effortless way as if the system had been in place for decades, and without any operational problems. 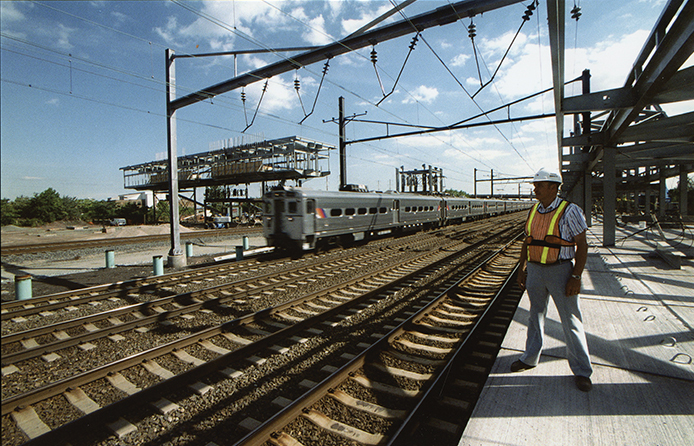 By the end of 2000, service is to be expanded or linked to the nearby Northeast Corridor of Amtrak and to New Jersey Transit, approximately one mile west of the airport on an elevated track crossing Routes 1 and 9. Piers for the new extension are already in place and noticeable from the highway. Completion is due by mid-2001. Six trains being manufactured in Switzerland will be added to the monorail fleet of 12. The $250 million rail link will connect the airport with the north/south service now provided daily by 90 Amtrak and 193 New Jersey Transit trains. Payment for the Newark airport monorail extension will come from a $3 surcharge on passengers using the airport. The Passenger Facility Charge system is paying for improvements at major airports throughout the United States. The extension at Newark International Airport eventually will carry about 7,000 passengers daily. The new terminal will consist of two 1,050-foot platforms, with elevators and escalators and a concourse spanning eight passenger and freight tracks. Construction of this new facility and the completion of the Newark Airport/Elizabeth extension of the LRT Newark will make it much easier to get to the airport without using the automobile. One of New Newark's largest commercial enterprises at the start of the 21st century is the construction of a $100 million Coca-Cola bottling and distribution works in the Ironbound on the site of the old Engelhard Minerals and Chemicals factory. The site is at Route 1 and 9, off the New Jersey Turnpike. When completed, the complex will include a $35 million distribution facility and a $65 million bottling plant. The former will translate into a 230,000-square-foot warehouse, which will employ 200 truck drivers, stock handlers and clerical workers. The bottling plant, set on a 175,000-square-foot tract, eventually will employ up to 900 in the production of the beverage. The decision by Coca-Cola to select Newark as one of its three regional production centers in the tri-state area was based in part upon the fact that massive amounts of pure water are available—the same reason that Anheuser Busch has one of its largest breweries in town and the same reason that Newark was once home to a half-dozen major American breweries. The site is equipped with large-consumption water mains capable of carrying 2.5 million gallons of fresh water daily to the manufacturing operation. Other reasons for locating in Newark were the income-tax incentives, job-training opportunities and water and sewer fees in lieu of property taxes arranged by the Newark Economic Development Corp. Although the project got off to a rocky start because of acquisition problems, Coca-Cola decided in September, with the encouragement and help of NEDC, to press ahead with the 41-acre project. In 2002, a major manufacturing and distribution facility will open on the outskirts of the heavily populated Ironbound. Four weeks ago, we began looking at a number of changes taking place in the city at the end of one era and the beginning of another. Our first view was of the image of the city itself by Newarkers and non-Newarkers alike, the state of the real-estate market, and the creation of the New Newark Foundation and the Broad Street Special Improvement District. Our second glimpse was of some of the great old buildings and landmarks rehabilitated for fresh uses, including the National Newark Building, the five new branches of the Newark Public Library, a revitalized Newark Museum, the newly relocated New Jersey Historical Society and recent additions at Essex County College. We also took a peek at brand new structures such as the Martin Luther King Court House, the Legal Center and the Otto York building at New Jersey Institute of Technology. In our third installment, we looked at some of the very large new complexes which ended the decade and which have had statewide significance as far as drawing people from across the state to Newark. These include the New Jersey Performing Arts Center, Newark International Airport, the new high-rises of NJ Transit and Riverfront Stadium. The glance this week at the new Newark included reference to proposed projects and projects currently under construction. Another metamorphosis has taken place over the past decade in housing. The concept of high-rise housing for the poor was originally challenged in St. Louis with the demolition of their high-rises. It was an implosion that was heard around the country, and Newark listened. Today, most of Newark's 'brick city' structures have been leveled and are being replaced by modest row or townhouses, which are affordable, attractive and, in some cases, eventually within the economic reach of its residents. Everywhere, two- and three-story houses have begun to replace the brick towers turned monstrosities. The effort today to provide adequate housing has been taken on by the Newark Housing Authority, the New Community Corp. and Hovnanian—the big players. A host of smaller builders and developers also have taken on the task of building the modest homeowner's castles. Newarkers are also on the adaptive rehabilitation road as interesting conversions of older structures such as the Tiffany factory, the Brass Works and the Chocolate Factory evolve. Once strictly traditional in its home-building practice, Newark has become a pace-setter in creating inventive new home-building solutions.